Let me be completely honest with you: I like dessert. Not just a little bit. A lot. Basically, I would rather eat dessert than dinner. In fact, I have often had dessert for dinner. I’ve become accustomed — scarily so — to dessert every night. And it turns out I’m not alone. This wasn’t a big problem before I had kids. Now, however, I have a 3-year-old (or, as he points out, a three-and-three-quarters-year-old). And guess what? He loves dessert, too! And not just a little bit. A lot. What a coincidence! We once went to Costa Rica so that he could see some monkeys and a white sand beach, and all he remembers is the chocolate I let him have after dinner each night. I am not kidding: if you ask him about Costa Rica today, he will tell you it’s a place where you can eat chocolate every night. When we’re talking about dessert, the habit is pretty obvious: There’s a cue (“dinner is over!”) a routine (“ice cream time!”) and a reward (“oh my god, this chocolate chip crunch tastes good, oh my oh my god”). What neurologists have learned is that habits are powered by cravings. In fact, if we could stick electrodes in my brain (which I wouldn’t recommend – very messy), we would see that as soon as dinner is over, my brain starts anticipating – which is another way of saying craving – that chocolate chip crunch. And if the ice cream doesn’t arrive? My brain gets unhappy, and starts giving off patterns that look a lot like anger — or even depression. My wife and I knew we had to change my son’s dessert habit. But how? When I asked the psychologists I was interviewing for my book, they told me that you can’t destroy or eradicate habits – you can only change them. The key, they said, was inserting a new routine – a new behavior – into my son’s after-dinner habit loop. So we got to work. We realized that whenever our son talked about dinner, he always mentioned dessert. He had become habitualized to associate mealtime with sweets. We went to work on that cue. Now, when we talk about dinner with our son, we emphasize all the other important aspects: the togetherness, the chance to talk about our days, the fact (well, as far as he knows) that Superman got strong because he ate lots of vegetables. And, most important, we found new rewards. If our son eats his dinner, he gets to read a story with me before bed. Every time he takes three bites of broccoli, we tell him a joke. (The knock knock banana one kills EVERY SINGLE TIME.) It’s not that we never let the poor kid have dessert — we just vary it, and keep him guessing. Sometimes it’s fruit. Sometimes it’s one marshmallow. Sometimes it arrives after his bath, and sometimes it shows up in his snack, before dinner. Habits emerge when patterns are predictable – when our brains learn to crave a specific reward at a specific moment. It has worked, too, and not just for desserts. If you play with cues and rewards, you can change almost any habits. Studies have shown that when people disable the buzzing on their smart phones, for instance, they stop checking their emails at the dinner table because the cue has been disrupted (and so the craving for the reward of distraction that email provides never materializes). Smokers who start drinking a double-espresso with their morning paper (rather than smoking a cigarette) are more likely to quit. Why? Because the caffeine provides a buzz that is similar to nicotine. The reward is still delivered – but the behavior has changed. P.S. GIVEAWAY!!! Comment below with a story about how you broke a habit (your own or your kid’s) and be eligible to win a free autographed copy of the book. UPDATE: A.E. Hoseth (#73) and Ali (#82) are the winners. Thanks for playing! Illustrations and cover design by Anton Ioukhnovets. Oooh, I need this book. If the book itself is as engaging as the guest post, it should be a winner! My story about breaking a habit is, alas, about a habit I broke but seem to have picked up again. A few years ago when I got serious about losing weight, I started taking a strenuous walk with our dog in the evenings. My kids were just getting old enough that bath and bed time weren’t taking so much out of me that I could only collapse on the couch after they were in bed. Without realizing it (though this post makes it clear to me now) I was not only starting the new habit of walking, but I was able to mostly overcome my terrible habit of munching away while watching tv in the evenings. After coming back from a brisk walk, it seemed easier to resist the snacks. I chalked it up to not wanting to undermine all that good effort by adding extra calories, but I can see now that it also effectively disrupted the expected routine for me. With my 30th high school reunion approaching I needed to break my almond croissant habit. I rescheduled my student assessments for 9 am, when the pastries are delivered. The time spent chatting with my students and their parents filled that same need as catching up with a co-worker over a 500 calorie croissant. Although I still have days I would rather ditch both student and co-worker for one of those croissants. They are wickedly delicious (as evidenced by the straining buttonhole on my pants). I NEED to kick my habit of late night snacking! I am trying to lose weight so I can shave time off my next marathon (in May). I think I can do that by stopping the late night eating. The book sounds like it could really help. Thanks! I just listened to the end of an interview on Fresh Air about the book and was planning to go back and listen today to the whole thing. I’ve always heard a new habit takes at least 3 weeks to become habit. It seems like only 2 days for me to break a habit… Starting in January I started getting up at 5:30 to go to the gym. I just got up when the alarm went off instead of hitting snooze 47 times. It was a habit for January and into part of February (or it became one). Then a few days off became 2 weeks off… became… Back at it this month, trying to make it a habit again. I can’t wait to listen to the interview and read the book! I might try some of these sneak tactics to work my way out of this routine! I’m also a habitual eater, and I’m finding that I stress-eat when I’m frustrated with my small children. So, I’m retraining myself to check email or listen to a favorite song in lieu of munching on chocolate chips. I love drinking beer. A good IPA at the end of a long day is the best way to unwind. But this proved to be a problem when I became pregnant. So I broke the habit down into it’s different components. I liked sitting on the couch, watching some TV, drinking a beverage. I like beer, not just because of the alcohol, but the carbonation. So I was able to replace my nightly beer with mineral water. Now that my daughter is 15 months old, I still buy more La Croix at the store than Goose Island. I was JUST listening this his episode of Fresh Air this morning! So many habits to break…procrastination, late night snacking (popular! ), keeping my apartment picked up during the week…to name a few. Wine with dinner is a bad habit. Obviously I kicked it cold turkey when I was pregnant but it’s pretty much back again! I broke my nearly-every nightly wine with dinner habit. Who doesn’t love a glass (okay, sometimes two) of wine with a great meal? Especially a crisp white with a summer meal…ahhh. We have the dessert habit here, too, along with the tantrums when it doesn’t materialize. Can’t wait to try a new approach! In other situations, (I’m thinking of the binky habit of all three of my kids), cold turkey worked best for us. One day the binky fairy swooped in and traded the binkies for a more grown-up toy, and the other lovies (blankets, stuffed animals) stepped in as the primary comfort objects. So interesting! I love that the topics covered here are so varied. I used to drink a ton of diet coke (ick) and coffee. I had some annoying health problems that I was told would subside if I gave up caffeine/sugary drinks. Instead of only drinking water, my strategy was to allow myself to purchase diet snapples and sugar free ice tea which I never liked as much as coffee or soda so I didn’t buy as many and gradually I weaned myself off of those too as I got used to drinking good old fashioned water all day. Every once in awhile I fall off the wagon and I use the same strategy each time to get back on track. When I quit smoking years back, I would take a brisk walk every time I felt like having a smoke. I would visualize my lungs filling with fresh air instead of smoke. I think it gave me that little energy jolt I was looking for,too. After the walk I drank a big glass of water to further “cleanse” my body. These techniques really worked for me. I quit “cold turkey” after smoking a pack every day for about 15 years! I used to be a late night snacker but I recently changed my habits so that I could eliminate that from my life. First, I started knitting every night. It is hard to eat when your hands are busy! I also brush my teeth early so I am not tempted to eat again. Can’t wait to read this book. In fact, I started my blog to help me to establish good habits while changing the old ones … And cleaning my house (or not cleaning and enjoying couch time instead) was one habit I really wanted to establish. I tried to take baby steps and set up a routine of daily cleaning. I created check lists, I set 15 minute timers, I looked at cleaning jobs one at a time instead of the entire, dirty house. This helped me to reach my goals of having a clean(er) house little by little. So I was never overwhelmed. I’m not saying it was easy, but felt achievable. Both my husband and I used our laptops to cruise the internet in the evening – even when we were supposedly engaging in family time together. “No more!” I announced angrily one night – to which he looked up with the foggily drear expression of a lost internet viking and said, “hmm?” We put the chargers and the laptops in the office, so now it takes more effort to cruise. Smart phones go into a basket by the coffee table. Now we are able to focus on each other and actually have that family time we so need! My husband and I just adopted a puppy, so we’re forming all sorts of habits – going for long walks every day (and trying to start going twice on weekends while he’s so young and rambunctious), listening to him let us know when it’s time to go outside, being consistent with all verbal commands, etc. I miss sleeping in on weekends, but walks are better for us! I guess my habit was laziness regarding meal planning. I used to improvise meals every night and to buy whatever I encountered interesting in the grocery store. Now, on friday night or saturday morning, I check the specials and plan ahead 5 or 6 dinners for the week (there’s always room for leftovers or scrambled eggs). The reward here is important, because I find it fastidious to do it, but I save up to 100$ a week doing so, so I keep doing it. i broke the habit of waking up early to run….need to get back on that one :). this book looks very interesting. I kicked the habit of making mundane meals by reading this awesome blog. When we started meals with my daughter (now 4), I was really good about varying the after-dinner routine. Sometimes fruit, sometimes yogurt, sometimes nothing and occasionally (1-2 x/week) a real dessert. When she started asking after dinner “whats’ for dessert tonight?” i knew we had caved too many times. I went back to fruit & yogurt for most nights. But I love your idea of a non-food end to dinner. As a child, we had dessert every night and my routine is that I don’t think a meal is over until I’ve had a sweet fix. I really didn’t want my daughter to end up with that habit (and the weight issue associated) too. Not sure if we’ve done as well as I had hoped but it’s still a work in progress as she’s only 4. I think rewarding kids with dessert for eating their entree is awful – I cringe when I hear other parents doing it. But it’s sooo tempting when they won’t eat the healthy stuff. How timely…my husband was JUST talking about this book last night, about how he wanted to read it. I am an avid runner and have a regular yoga practice. I was getting these intense cramps in my calves and feet at night (some call them charlie horses). After a visit to my doctor, it was decided this was a dehydration problem. Sure, I drink water immediately after a run, but that was it. The rest of the day, it was caffeine via coffee and diet soda. I purchased a 32 ounce bottle and keep it at work by my desk. I still allow myself a coffee in the morning (hey, no judging…I get up at 5:00 a.m. to run). But after that, I hit the bottle…the water bottle. Well….. I haven’t broken a habit successfully, and that’s the real reason I am interested in this book. I can successfully take breaks from coffee, dessert, etc but I’d love more insight into how to make things stick. three pregnancies turned me from a lover of salty snacks to a Must-Have-Chocolate-Now! person after every meal. Lately, I’ve replaced chocolate cookies with dates; took me a few weeks to be happy about the switch but I still get a sweet fix, just a different, healthier one. our 2-year old had gotten in the habit of watching tv at breakfast, but when he started asking for it at lunch and dinner we knew we were in trouble. so now we have a “no tv at meals” rule (took a week of temper tantrums), but if one parent is on their own they can break it for sanity if necessary…like the author, keeps him guessing when he might get it as a treat, but it’s not expected. and means we now have DALS-friendly meals with something resembling conversation! I stopped biting my nails by keeping them painted because then they looked pretty. I also try to keep them short so I’m not tempted. In order to kick the dessert habit I think I’ll have to do a lot more than that! I need this book to break a very deeply engrained dessert habit–not for weight loss but just the principle. I helped my fiance develop a “wake up in the morning” habit. He was a compulsive snoozer (when he wasn’t sleeping through his alarm), so I invested in a Sonic Alarm Clock that we place across the room. Usually I’m awake before him, so I don’t have to be roused by the heart attack-inducing siren (that can be heard from the Street)! When I was diagnosed with a gluten intolerance, I HAD to change my habit of ordering a pastry with my morning coffee or tea. So I “upgraded” my plain coffee or tea to a fancy drink, like an iced mocha or chai latte, and skipped the pastry altogether. Most of the time it works pretty well. I used to be a coffee addict, I mean I was HOOKED! It’s not even really the caffeine but just the smell of coffee, its warmth, even its acidity. I replaced it with tea but it was not easy. Switching to tea at first did not seem to do it for me. I had to get fancy and find teas that inspired me in some way or served a purpose. I started drinking nettle tea which is an important supplement to my diet for its content. Anyway, since it does not have the best taste, I make it fancy with lemon and honey sometimes. It has become a whole ritual in the morning. I steep an entire glass jar of it and have it around all morning. Although I occasionally splurge for a decaf cappuccino now and again, I have pretty much gone off caffeine completely and feel much better overall. It takes work to break habits and the longer the habit is around; the harder it is to kick. For me it is the wine after work habit that I am in the process of breaking. I have been noticing that the scale is slowly creeping up and so has my wine consumption in the evening. It is a hard habit to break, believe me, because the first sizzle of the pan and I want to have a cold glass of white wine to sip while I sautee. We won a SodaStream at our son’s school auction this past weekend, so I am drinking seltzer IN A WINE GLASS, just to have the feeling. It feels about as sane as smoking an electronic cigarette that doses out the nicotine without the smoke. I’ll get over it. If I don’t win the book, then I am going to get a copy at the library. It sounds like a fantastic read! Since it’s Lent and I gave up dessert, I have, by default, broken my habit of eating sweet snacks throughout the day (when available). This has worked so well that I think I might restrict sweets to weekends only once Lent ends. I successfully managed to switch my nightly dessert habit with a peppermint tea habit…and then the holidays happened. But I figure if I did it once, I can do it again! I’m horrible about wasting time on the internet. I’m a grad student, and have had some success in setting a timer for an hour, then taking a five minute break to get up and straighten up the apartment. It’s more satisfying than procrastinating with internet comics. I broke a nightly TV habit a few years ago. I used to turn on the television every night after work. Then, I decided I would only turn it on if I knew before turning it on what I would watch–no more channel surfing. Now, I only turn it on a few nights a week, so I fill my evenings with more productive activities (e.g., talking with my husband, catching up with friends, and reading). If only I could enforce the “no surfing” rule on myself with the Internet. Of course, if I never surfed the Internet, I wouldn’t have found DALS! My worst habit I broke was late night eating in front of the television. We needed to break the habit of second helpings at dinner (in order to encourage eating more veggies instead of the meat and pasta, etc). Now my son has to wait 20 minutes for “seconds”, and then only can he have more veggies if he truely is hungry. The 20 min wait actually makes him realize he isn’t hungry (just wanting more because it tastes good) and he usually gets distracted too. Plus he eats slower too. Super fascinating! I really enjoyed the NYT article on marketing at Target, which I bet was a good preview for this book. I have becoming very interested in studying nutrition from the perspective of psychology, so I’m looking forward to reading more. I think perhaps one of the biggest habits I broke was drinking sweet beverages with dinner. My husband and I used to buy a gallon of Arizona Ice Tea a week, now we buy a half gallon and it lasts nearly a month. I did it by joining in on a challenge to cut out processed foods for a month. The cue was dinner, the routine, a glass of ice tea full of high fructose corn syrup and other unpronounceable ingredients, and the reward, simply quenching my thirst. Good thing water accomplishes that goal just the same. I still keep myself guessing though, an occasional glass of something other than water is allowed, even though I’ve come to appreciate water does the best job of them all. I also have a shameful dessert habit. I have always loved the dessert course best, but in the past year have slowly allowed myself to erode into a dessert-every-evening style of life. I am having trouble breaking it; I’m going to check the library for this book. It may be coming just in time! My kids are also very interested in dessert. We’ve done a lot of the same things Charles mentioned, and it certainly helps. Now we get the “what’s for dessert” question a lot less often. If that only worked for the parents, who seem to snack after the kids go to bed…. Trying to break my mindless consumption of sweet treats and sugar. When I was pregnant last year, I started eating 2-4 munchkins each time I went to a favorite donut chain … which turned into a daily habit b/c I was habitually drinking decaf iced coffee. Now (thanks to the brisk March weather), I’m off the iced coffee and breaking my association with munchkins. I could use some habit rehab in some other areas of my life too … would love to check out the book. I stopped biting my nails by learning to knit. Many years ago I broke a soft-drink habit by imagining the drink filling my body with nasty chemicals when I was tempted. Now I don’t even crave them anymore. I’ll only drink an occasional coke with popcorn at the movies, and not every time. I kicked the smoking habit by breaking associations — first I wouldn’t smoke while I was driving (did that for a week), then I wouldn’t smoke while I was talking on the phone (did that for a week), then I would wait at least 10 minutes after putting down my fork to light up. It took a long time (and I still occasionally think about smoking), but it did work. Would love that book! Thanks for the giveaway. I teach and am starving by the time I get home after school and working out. That means immediately snacking and usually indulging in a glass of wine. To stop the snacking esp on cheese, we invented Thursday wine and cheese night. No cheese allowed those other nights. Plus, I get to cook for my friends on Thursdays, so it’s something to look forward to (the reward?). I also like seeing the lower grocery bill when I snack less. Maybe another reward could be putting the savings towards vacation fund – – or our small but growing “sabbatical year” fund. I kicked my soda habit by choosing iced tea. I found I loved the cold drink with ice and iced tea was a close second for the same “feel” if not taste. I’m going to get my hands on this book! I am trying to start healthier habits with my kids too. We’ve switched up our ritual Sunday-breakfast-out to go to a restaurant along a lovely scenic riverside walking path. So, now we still have our favorite Sunday breakfast fix, but we follow it by unplugged family time along the river and get a few miles walking in too! i’ve recently learned that the only way i can create good habits in my daily life is to try to do things every day. it ends up being less than every day, but better than not at all. running, for example: if i set a goal of running every day, i will probably run 4-5 days that week. if i map out a schedule to run every monday, wednesday, friday: i will be disappointed if i didn’t go on monday and that disappointment may lead me to not go on wednesday. or, if the weather’s bad, i may not reschedule that particular day. i’ll just wait until the next day. i won’t go on the off days, ever. so i’ll end up only running 1-2 times per week. i’m a very all or nothing person. I had a habit of…is this gross?…being too lazy to floss my teeth. I was just too tired at night and it felt like it took forever when sleep was anticipated. So, now I floss right after dinner. Kids are in the bath, I am hanging with them…flossing, facewashing, vitamin-taking. All of my skip-it-because-I- am-lazy things at once! I do two things when I feel the sweet habit kick it up a notch, from “hmmm, that sounds good” to “oh my god, where is it?! Where is it?!?!”. I let myself binge on what’s in the house, then I just don’t bring it into the house anymore. Not having it instantly available is the perfect interruption to the habit loop. We are in the process of breaking sugary cereal habits in the morning with my 6 and 4 yr old sons. It is so hard!! Any tips would be appreciated. We decided to do more educating and talking with the boys about better fuel for the day. Thank goodness they like eggs! The other habit is television while I am making dinner. As soon as I walk into the kitchen the boys want the TV on. Then when it is time to eat they throw a fit. Thankfully, our TV broke a couple of weeks ago. The habit is out of my hands! Our family had a bad habit of drinking juice with lunch and supper so when we spent 8 months living in Norway, I told the kids (step 1) I couldn’t find it in the grocery store, then (step 2) it was way too expensive to buy here, and then finally we progressed to (step 3) water is a healthier choice. When we moved home I made a point of sticking with our new water habit and reserving other beverages for treats. This is awesome! I’m converted my late-snacking habit into a hot-chocolate-in-the-evening habit. I’m not sure if it’s better for me, but I’m convincing myself it is. I stopped drinking coffee by developing chronic heartburn. While it still tasted delicious, it felt like battery acid in my stomach, so I stopped. It made me a little sad at first, but the aversion to pain outweighed everything. I used to buy grape or cranberry juice but was aghast when I saw the sugar content. So now I’ve started putting lemon slices into my water, and that’s enough flavor for me. This topic is completely fascinating to me! I can’t wait to read this book! I used to have the awful and expensive habit of buying coffe on my way to work every morning. In my mind, the coffee from my local shop tasted better than what I made at home and it seemed easier & faster to pick it up during the commute, than to take the time to make it myself at home. In working out a new budget a couple years ago, I added up all the daily $2 coffees and $4 lattes here and there. When you look at that total over a week, month and year, it was shocking how much money I was spending. I pretty much went cold-turkey on buying coffee, and started making it at home. Taking 5 minutes out of my morning routine didn’t seem like such a hassle any more. I broke my soda habit. I would have one every afternoon at 3pm at work. Every day I needed that extra boost of caffiene it felt like. So instead I kept gum and water at my desk and when the soda craving would hit I would put in a piece of gum and chug the water. Not only did it save me $$ it made me feel so much better. I would love this book I always think things like these studies are so interesting. fingers crossed! I have broken many habits over the years (sometimes to be replaced by other habits that then need to be broken)…..like when I was a kid I broke the habit of nightime thumbsucking by relacing it with rubbing my feet together (which for some reason is very soothing for me)….it is habit that my partner of 20+ years wishes that I would break! It is interesting to see that my daughter is now a foot -rubber! Thank for the chance to win this book! Oooh, I just heard the Fresh Air interview about this book yesterday! Fascinating! I broke the mindless habit of eating in the car by not keeping food in there. It was REALLY hard. I was like Pavlov’s dog, the second I sat down to drive to work because I was so conditioned to eating my breakfast like that. I broke my checking-personal-email-all-day habit by giving myself 3 times to check it during the day: 9, noon, and 4. Because I became way more productive at work, I felt the reward of checking things off my to-do list and now I sometimes even forget to check personal email! Great post. 40% of our decisions are habits – Scary! When I am watching my weight, I have been successful with having a cup of Good Earth sweet and spicy tea after dinner instead of dessert. I feel like I’m still getting a little treat, but without the sugar. oh man, I have been dying to read this book since I heard about it. I am breaking my NO EXERCISE habit! Now I get rewarded for going outside (sunshine, feeling the wind on my face) instead of sitting inside (watching TV, too much screen time). I’ve gotten more time with my family and better health! Yahoo! I love this! Personally, I recently switched from coffee to green tea. With the kids I teach to cook, we build in a routine where we eat once everyone is sitting down. Table manners absolutely fits into this important conversation. Thanks for taking on this great subject! I stopped biting my fingernails when I was I high school, not sure what I did to break the cycle back then, but now I paint my fingernails in all different shades with lots of fun designs! I had to break my coffee habit when I got pregnant, so I went from 4 cups of black coffee a day down to 1 cup a day plus 3 cups of black tea, to several cups of green tea, and now I do a maximum of 1 cup of tea a day, plus hot water whenever else I’m craving my hot beverage. Its not as satisfying as coffee by a LONG shot, but its working. . . This book sounds fascinating, and many thanks for the guest post. We broke our son’s pacifier habit when his routine changed and he moved out of his crib and into a bed. We hid all the pacifiers (out of sight, out of mind) and set up some new “rewards” for him, like cuddling up on the bed during story time. It worked surprisingly well – it wouldn’t shock me to read that it is easier for children to change their habits than their (older, more ingrained) parents! I kicked my afternoon cookie habit (and I don’t mean a small cookie occasionally after lunch, but rather an enormous face-sized cookie from the bakery next to my office every single day at 3 PM on the dot) by finding a recipe for a healthier cookie made of oats and bananas and dark chocolate chips and stocking my office freezer chock full of them. These cookies are healthier than store-bought granola bars but still feel like a treat! We have been “thinking about” breaking our nightly family dessert habit, but have not been able to commit so thank you for this post!!. As a side note, I read this entire post while sneaking chocolate chip cookies for myself!! Our 2 boys broke the thumb sucking habit by wearing very cool skull mittens to bed. This not only made them stop at night time, it had the bonus effect of breaking the habit in the day as well. The best way to get rid of a bad habit is to replace it with a good one. I find associating songs with actions helps a lot, I don’t have to tell my daughter to do something (and risk an emphatic NO!). I simply start singing the “clean up” song or the “going to bed” song and she knows what’s coming. Another key point is to do myself what I want her to do, toddlers can’t resist imitation! I quit sucking my thumb when I knew the braces were coming off – please don’t tell my parents even though it was 25+ years ago. I knew I had to stop and probably was emotionally ready to stop – it was cold turkey. My dessert habit – I’m not emotionally ready to stop yet. Great post – I had an afternoon coffee break habit, first by scheduling meetings at that time but also allowing Friday only coffees. A habit I’m still working on is checking my email all the time while I’m doing work on the computer. I’ve been not opening my browser when I’m just working on spreadsheets of word documents and it seems to have helped. What a great topic! And just as I was sitting here, thinking of ways to improve our 7 year old’s homework habit! I broke the habit of grazing from the time I walk in the door after work, until dinner time, by making a cup of Melita-brewed coffee. It slows me down and gets me focused on that, rather than on munching. Of course, don’t get me started on my coffee habit! My husband and I broke our habit of eating out almost every night by thinking about dinner at lunchtime. Otherwise we were too worn out, and it seemed easier to just go pick something up. It really doesn’t take any more time to make a yummy pasta dish than to go wait for something to be made, and it tastes much better! This is fascinating… this could help me with some of my bad habits. One habit I’ve gained (that can be as important as breaking, right?) is getting up early to excercise: it was hard, at first, when it was dark, but soon enough the good feeling of being awake and ready to start the day– and having free time in the evening to *not* excercise– made it worth it, and after a few weeks, it became the good habit. 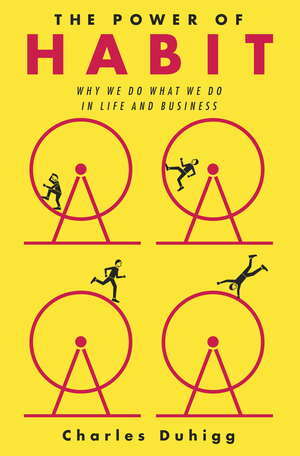 It’s hard, though, when that routine gets broken again– perhaps Mr. Duhigg’s book elucidates that! My husband and I started the dirty habit of eating something like dessert after our kids got into bed. It was our “treat” for getting through the day with two small children close in age. Now they are older and we STILL can’t wait till they get to bed, we have wide eyes just waiting for the time our boys’ heads are laying on their pillows. As we leave their room my husband poses the question, ” what is it? What is the treat tonight?” Six years later we are still doing it! We can’t break the “their in bed” habit! I would love to win this! I heard his interview on NPR and was so interested I drove around the block a few times so I was able to listen to the whole thing! The habit I am proud of breaking is staying up late. I was a total night owl before my son was born. I would read, watch tv, catch up on emails, occasionally move furniture (seriously) but would be so tired the next day. That kind of tired plus life with an exuberant toddler, is punishing. Now I go to bed when my early bird husband does. I sometimes miss my late night alone time, but my body and mind are certainly better off! I would love a copy of this! Some years ago I broke the bad habit of staying up too late by simply turning off the tv at 10pm. I realized that if I watched the 10pm show, I would then be tempted into watching the news, from which it was an appallingly simple step to David Letterman and doom the next morning. Alas, since then I have married a man who loves the 10pm show (*any* 10pm drama, it seems) and the late nights have crept back in. I recently semi-broke the habit I had fallen into of getting take-out every night instead of cooking at home. I muscled through the cravings and it’s still a struggle to be strong (so clearly I have not addressed the cues and rewards!) and I can’t wait to read this book to help me figure it out once and for all (whether I win it or not). I broke the habit of turning on the tv every night after I got my daughter in bed and then staying up too late. It was so hard to get up and make myself go to bed. I broke the habit by putting the tv in a place where it was harder to get to and more uncomfortable to watch. I could still watch the things that really mattered to me (like Obama’s inauguration and the Olympics), but it was too much trouble for your average evening show. Now I see that it was partly successful because it broke my routine. I recently broke my habit of not planning what to cook for dinner. Now on Saturday or Sunday I figure out which recipes I’m going to make and all the ingredients I need. Now I (usually) only of grocery shopping once a week and dinnertime is not a mad scramble. Can’t wait to read this book. About 6 months ago, I gave up sweets. I broke this habit by eating a lot more protein, especially in the morning when I crave a donut, or muffin the worst! Now I eat eggs followed by a chocolatey protein shake made with almond milk. It satisfies my sweet tooth and gives me the extra sustaining energy I need to make it to lunch. I am so excited to read this book. I broke the habit of eating at night by replacing my evening grazing with some mint tea. It’s satisfying and allows me to enjoy the food I eat in a more thoughtful manner, rather than boredom snacking. Unbelievable. My son was just whining about dessert after dinner as I started to read this post. I made a weekend only dessert rule in our house but I don’t think it’s the answer to my problem! You gave me lots to think about …. So fascinating! I am a teacher, and after picking up my son from his school, I’m starving and in need of a “break” and a reward. We both take some down time at home, and that’s usually when I eat sweets. Sometimes it even snowballs in to constant snacking from 3:30 – dinner! (yikes!) I’d love to change this habit. In the past I gave up sweets all together when training for a competition. I did give up my Facebook habit – by giving it up for lent. Hmmmm . . . maybe a walk after school, and a big glass of water would help?? Wow. This resonates with me like a GONG! I can’t wait to read this book! I have conquered and replaced a couple of big habits during the last five years. I had a Diet Pepsi habit that had me consuming +2 litres a day, every day, at all hours. When I decided to focus and fix it, I left an emergency can of DP in the crisper and filled my fridge with bottled water. Over and over again I automatically went to the fridge and had to choose water instead. After a weekend of this, I thought I had the problem licked…then I went to work and had to face the vending machine and all of my work related habits. But I did it. Food was my other big habit. I lived on a diet of “beige” food (fried foods, carbohydrate delights, next to no vegs) for years. Two years ago I sought out the right plan for me and replaced my old habits. It’s important to know what cues us and to know when we’re at risk of returning to our default setting. It’s easier for me to make good choices when I’m not “starving” or over-tired, and I have little rules to help me cope in “risky” situations where I’m likely to default, i.e. social functions, movie theatres, etc. I think the easiest way to kick a habit it to change the routine. It’s a little bit of a cheat, but it worked! I started a new job – which fortunately does not have a candy bowl at the front desk, or free bottomless coffee all day. And, guess what? I no longer munch on candy during the day when I’m hungry (bored) and I limit myself to the morning coffee at home only. Hooray! Other than this I’m pretty healthy, I eat well and exercise 5 days a week. But I want to kick the sweet tooth habit! The book sounds really interesting, I’m going to pick it up and check it out. We used to have a great morning gym routine, and, like some other posters, a move disrupted that routine. Time at the gym became time clearing the yard, demo-ing bookcases, etc. Now that the house (and even the yard, surprisingly) are under control, it is time to get back into the exercise habit again. This book seems like it has the tools to help instigate! I heard Michael Pollan say in an interview that if you only make the foods we consider to be indulgences yourself, you will probably be less likely to consume them. This resonated with me! So, I adopted the rule that we only have homemade desserts. It has been effective. I’m a working mom, and this is one situation where I actually feel good about the fact that I don’t have enough time to do it all. Treats really are a treat, and the dessert habit has been broken. I think I could never leave my dessert habit. I’m weak. One habit we started lasted year has been making our bed each morning. And we really didn’t have much discussion of this change – though we had not made our bed daily for the previous 11 years of our marriage. But it was quick, easy & gratifying, which I assume is why it stuck. Cue: we are up & out of bed, routine: make bed, reward: small amount of order brought to our world. Great post – would love to read this book! I needed to kick the habit of buying and then immediately eating those small chocolates that they always have at the check out lines in Whole Foods. So good… but really not good for me. Now I try to make sure I’m chewing some gum when I hit the check out line and I’m better at not buying the chocolate (though not totally reformed). I am definitely a creature of habit. It’s a comfort thing for sure. One way I kicked my “have to have sweets at night” habit was by replacing it with a cup of warm tea. I sweeten it with a bit of Splenda, and though I still feel pangs of wanting desserts at night, the tea has become a comforting thing, too, and so I am happy! Chapstick…I used to be addicted (for years)! 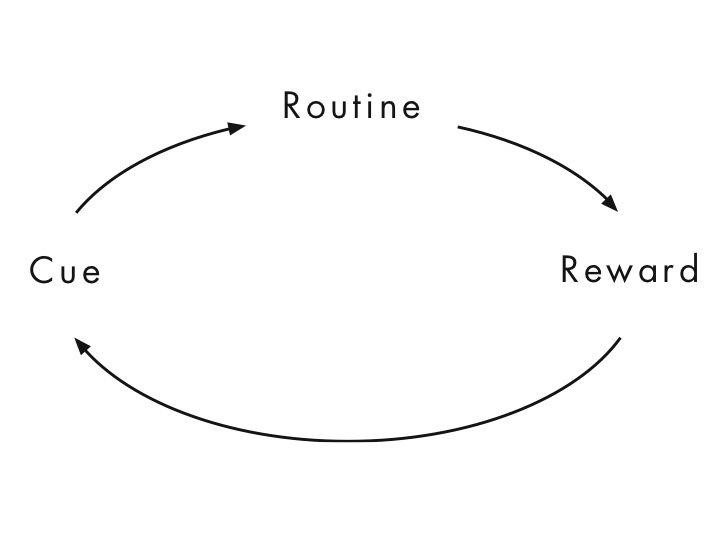 And I can totally recognize it now as a cue/routine/reward cycle (and I’d add comfort too). Eventually I had to go cold turkey and let my lips run the cycle of learning to keep themselves stayed moisturized by themselves. It sucked! But, I hardly use it anymore and it’s nice to not be dependent on it. I totally understand what he is saying about the reward that is distraction! I’m a student and I had a bad habit of web distractions when I should be studying in the library. “just a little break” turned into a long-time bad habit. I just had to stop! So I quit facebook and removed the links from my website. Somehow it helps–now I just go the websites I remember from memory–instead of having links easily accessible. Its a small thing, but just putting a little hurdle in, helps me to limit my online time. I’ve kicked annoying habits by changes in circumstance (moving, new job, different daytime routine etc.) but I never thought of it like changing my routine. Great insight. Now I just wistfully remember those days when I used to eat perogies for dinner every night and drink diet coke all day. I heard about this book the other day and it has already started me thinking in different ways about my day to day life. Imagine my surprise to see this awesome post here! So my problem is not in breaking a habit as it is with creating a habit. I have so much trouble committing to something. Having just read the NYT article about this book was the encouragement I needed to set a cue to trigger me to get back on the treadmill. I am trying to create the habit of running. I would love to win this book and read further on this topic. THANKS for the giveaway. I am really struggling with a BAD “online reading/surfing when I should be working” habit right now. I could sure use some help! I did break a bad habit of bouncing cheques and forgetting to pay bills a few years back by setting up online banking and automatic withdrawals. Worked like a charm. I used to need something sweet after every meal. I broke the habit slowly by stopping the “after breakfast sweet”, then limiting the “after dinner sweet”. Now, it’s just an “after lunch sweet”….mostly I try to eat dark chocolate, but sometimes I splure on my favorite….pie! Fantastic post and insight! Thank you very much! Love your idea on different rewards and giving “treats” at different times! (I’ve also found that dried fruit works well as a special treat, that I approve of! ).